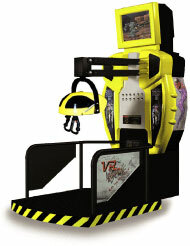 May 7, 2000--San Jose, Calif.-- Global VR's flagship VR Vortek arcade platform made its debut on the charts in April at the lofty Number One spot. Every month, Playmeter Magazine ranks the top-earning arcade games according to a survey of industry leaders. The April 2002 Operator's Choice Equipment Poll showed the VR Vortek out-earning such well-known games as SEGA Daytona, NAMCO's Alpine Racer 2, and Midway's Arctic Thunder. The VR Vortek and Beachhead 2000 also debuted at number two on The Players Poll in the May issue of Replay Magazine, another monthly industry trade publication. Again, the VR Vortek beat out games from video game powerhouses SEGA, NAMCO, Midway, and Atari. These back-to-back industry accolades establish Global VR as the most exciting company to emerge in the coin-op video game industry in more than a decade. Milind Bharvirkar, President of Global VR, stated, "The results of both of these polls are truly a testament to our business strategy of providing solution based products for our customers. Global VR is committed in its mission of providing the best entertainment available on the market." The PC based VR Vortek System is available in Standard and Deluxe models and features upgradeable hardware, exchangeable software, unique virtual reality interface, longer product life cycle and Blockbuster titles such as Heavy Gear II, SIN, Beach Head 2000, Beach Head 2002, and Incoming. The combination of the platform, diverse titles and upgrade kits has proved a winning formula for higher operator earnings. Global VR is the leading manufacturer of virtual reality arcade games. The company's VR Vortek is the world's first walk-up, coin-operated virtual reality system. Utilizing a PC platform with a boom-mounted display, the VR Vortek offers location owners the benefit of having infinitely interchangeable titles in a non-attended simulator. Offered in the VR Vortek Deluxe, Standard and 3D cabinets, VR Vortek offers players a truly immersive 3D experience with force-feedback and is now available with five different software titles: Beach Head 2002, Beachhead 2000. Heavy Gear II, SIN and another new title, Incoming! Playmeter and Replay are top monthly industry publications and the only trade magazines that present these polls. The Operators choice has been ranked the number one industry poll and reflects important feedback operators are receiving from players. In a highly competitive market, the equipment poll assists operators in identifying strong earners and ultimately helps them make their purchasing decision. Legal Disclaimer: This press release contains certain forward-looking statements. Forward-looking statements are generally preceded by the words such as "plans", "expects", "believes", "anticipates", or "intends". Investors are cautioned that all forward-looking statements involve risks and uncertainties that could cause actual results to differ materially from current expectations.